On 25th September 2014, Rex Minerals was granted yet another Exploration Licence (EL5362) on Yorke Peninsula Referred to as the “Whiting Area”, it comprises seven pockets of land (Areas A to G in Figure 1 below). WHY IS REX ACQUIRING FURTHER EXPLORATION LICENCES, GIVEN ITS CURRENT DIFFICULTIES IN GETTING HILLSIDE OFF THE GROUND? The reason may be found in Rex’s 2014 Annual Report (page 4) which notes: “The Hillside Project is one of many potential large-scale copper-gold projects on the Yorke Peninsula within Rex’s wholly-owned exploration licences on the Yorke Peninsula”. Rex has previously stated that, once it starts to build the Hillside plant, it will aggressively ‘look at’ 50 other potential targets so far identified within its existing licences. Rex’s goal? To develop a network of large, open-cut satellite mines with raw material transported back to Hillside for processing via a series of haul roads. Will the acquisition of Rex’s new Exploration Licence mean more satellite mines, more haul roads cutting across the Peninsula’s prime cropping land, more contaminated dust, more threats to groundwater, more risk of pollution of the Gulf and more minimalist rehabilitation strategies? When Rex have finished, will anything be left for future generations other than a landscape pock-marked with open pits and piles of waste rock? MINING and FARMING CANNOT CO-EXIST. Prime agricultural land cannot be sacrificed for short term mining. While Rex Minerals’ proposed Hillside mine is the only one so far on YP to reach the point of a full mining lease proposal, at least eight other exploration companies are now operating on the Peninsula. Two announcements in recent weeks indicate that these other companies are finding economically viable deposits of copper and other minerals. In the YPCT (6th May 2014) Adelaide Resources reported that their discovery that their discovery of various sections of copper at West Alford are all connected as part of one large zone, indicating a “very large mineralized system”. The company claimed this was “a real milestone in the development of a Mining Project”. In this ASX release, Marmota announced high grade copper assays on its ‘Champion’ prospect at West Melton (near Paskeville). The company claims there is a strong zone of high grade copper mineralization approximately 1 km long and 750 metres wide. 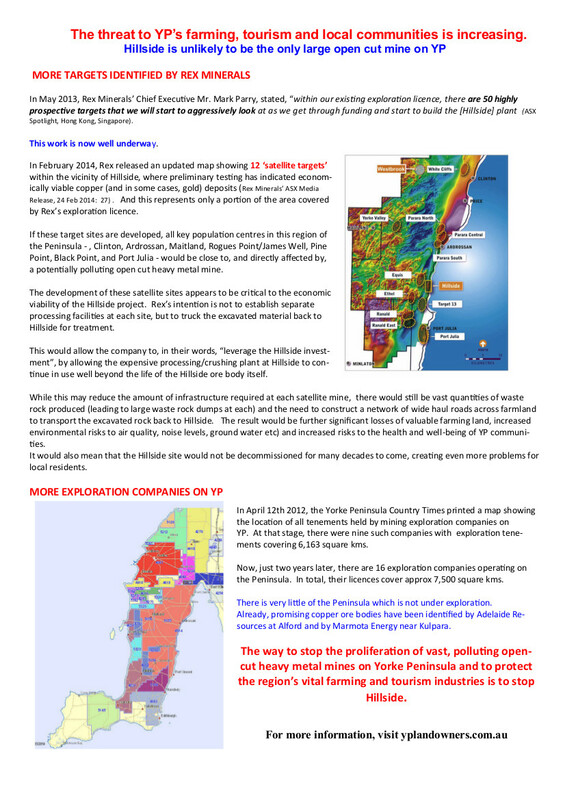 These two announcements, combined with YP copper discoveries by other exploration companies over the past 12 months, highlight the real and imminent threat posed by mining to agricultural activities across the entire Yorke Peninsula. This is no longer an issue affecting just the farms in a localized area around the proposed Hillside mine. It is now a fight for the entire Peninsula. Please become active in fighting against invasive mining on the Peninsula. Please join YPLOG and help spread the message. Please alert your neighbours by passing this information on to them.